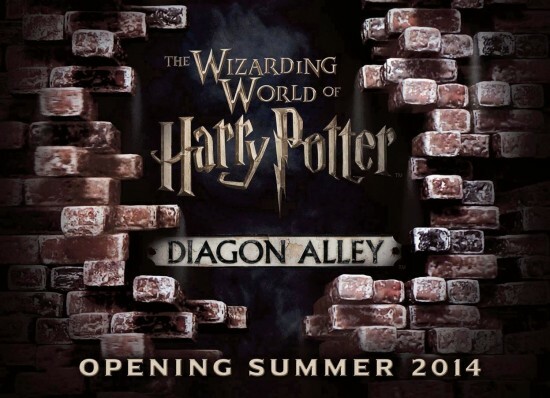 InSanity lurks Inside: Harry Potter and the Escape from Gringots and Diagon Alley Details! Harry Potter and the Escape from Gringots and Diagon Alley Details! Kitsune here, and I'll be your guide through all the news and updates coming to us live from Universal this morning! So, with that, let's get on with it, shall we? During the live webcast, Universal Orlando has released even more information about the Diagon Alley expansion of the Wizarding World of Harry Potter. The expansion, which takes over where Jaws used to be within Universal Studios Florida, has been watched like a hawk ever since the project was announced. The live broadcast was done in front of a facade of Gringot's Vault (maybe a mock of to represent part of the new dark ride?) that's the corner stone of the event and judging by the details as Mark Woodbury, Universal Orlando's Creative Director, talked? Holy crap this thing looks awesome! The level of detail has been heralded by stars of the film and it's an amazing immersive experience. First up? The Hogwarts Express, it's an entirely movie accurate reproduction. Every detail is represented, but is complete unlike a traditional set would be where filming is done in pieces and the like to allow for camera work. Guests will be able to board either at the Hogsmeade or King's Cross stations. Also, the trip from each direction will be completely different experience as well, which only makes sense, as you travel from one area of the park to the other. In Diagon Alley, several of the shops that were in the movie will be featured. Including the Magical Menagerie, Madam Malkins, an all new Olivander's, Scribullus, Wizeacres Wizarding Equipment, Weezely's Joke Shop and Quality Quidditch Supplies and of course the Leaky Cauldron as well will all be featured. Each of these shops will be decked out to the nines just as their movie counterparts were on film. Yes, that's right, if it's sold in them on film, it will be available in the shops as well. That's right, you'll be able to buy all your Quidditch gear at Quality Quidditch Supplies from robes and other things from your favorite teams along with various stuffed animals and all kinds of things from the Magical Menagerie as well. Guests will also be able to fully outfitted with robes and other wizarding wear at Madam Malkins! For more info check out our detailed post about each shop and what they'll offer! Knockturn Alley will also be featured, in a much darker and mysterious manner, this is extremely important to Universal to bring the forboding atmosphere to the area. One of the biggest features of Notcturne Alley will be Borgin and Burkes, where guests can purchase Death Eater masks and other "dark side" paraphernalia! Last, but not least, Universal unveiled the official name for the center piece ride for the new Diagon Alley expansion, Harry Potter and the Escape from Gringots. It's promised to be like nothing else that's been seen before. It's a multi-sensory, multi-dimensional experience that promises to top even that of Harry Potter and the Forbidden Journey! There's going to be more details announced in the coming months, so we're just going to have to wait for even more details to be released from the Universal Orlando Creative Team.